When it comes to getting the perfect baby chair, one needs to focus on safety before anything else. Once that’s covered, you can rest assured that the toddler will be able to rest comfortably in the seat while you are feeding him or her dinner. Even if the product needs to be secure, easy to fold, convenient, and comfortable enough so as to allow your baby to feel at ease, it doesn’t have to be ugly. 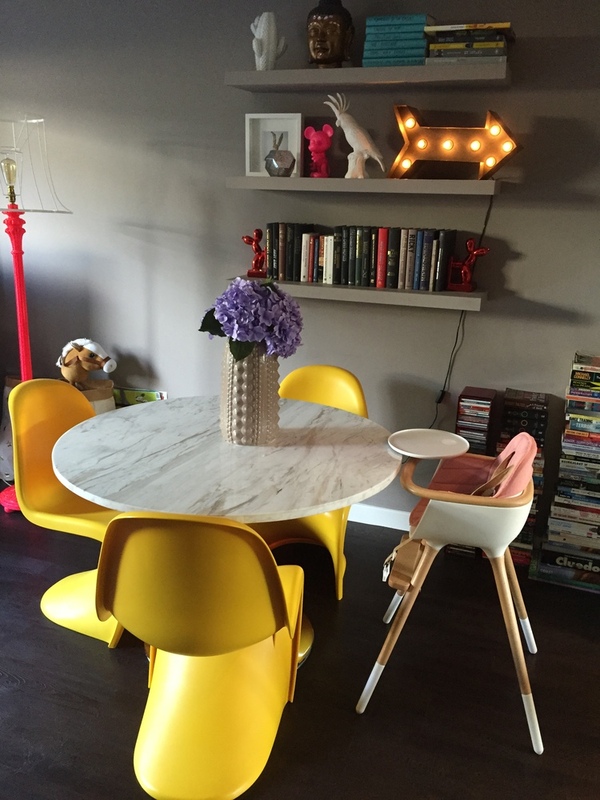 An eye-catching design can tie your kitchen together, but you need to make sure that you match the looks of the baby high chair to those of your furniture. Check out our suggestions if you’ve run out of ideas. This product has a curved backrest that hugs and supports the body of your baby so that eating can be done in ergonomic conditions that are both fully secure and comfortable for your kid. Because the table can be adjusted, this item can be used for a longer period of time, even as your baby grows taller. The chair is made of plastic. The main reason for this is that plastic is easier to clean, which can come in handy for very busy parents who can’t afford to spend an entire afternoon cleaning soup off the kid’s eating place. This item comes with a magnetic support both on the back of the tray and on the tray support so that putting everything in the right place can be done easier. Additionally, the tray top is also magnetic, which helps diminish the mess that usually occurs whenever you’re trying to feed your baby. Because kids are highly energetic and clumsy when they’re small, the 4moms High Chair comes with a nice, intuitive design that can turn your time with the baby into messless fun. In addition, the item is high enough for you not to have to sit uncomfortably while feeding or supervising your kid. The coolest thing about this product is that it can be used in many ways, either as a dining table for your toddler or a chair for an older kid to sit in, depending on your needs. 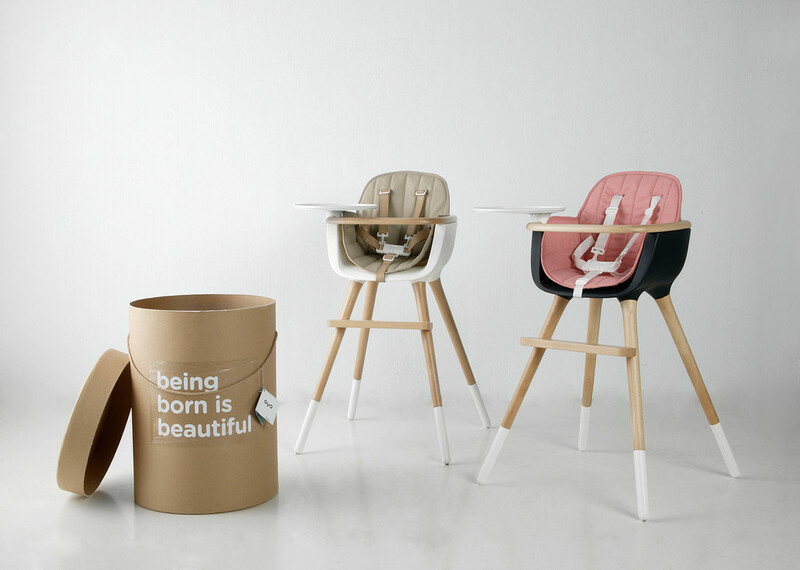 This versatility allows the chair’s functionality even after your baby grows older. The product has a removable and reversible chair pad, which can be easily cleaned in the washing machine. Given that occasionally kids will make a mess during meal time, the product comes with a built-in cup holder, in an attempt to prevent drinks from being spilled all over the place. This way, you can focus on spending quality time with your baby. This high chair has a pedestal that is equipped with a pneumatic lift, and it is designed not to allow any crumbs to get in the places that would otherwise be so hard to clean. The tray can be easily cleaned in the dishwasher, and you can lift it as much as you need to fit the height of your table. The item has a removable seat pad that allows both easy cleaning and a comfortable position for your baby. The chairlift is activated by foot so that you don’t have to do it manually every time. The Cosco Simple can be easily folded flat, which makes it perfect for families who are trying to avoid crowded spaces or who need to travel very often. The seat is really easy to wipe due to the material it is made of. The smooth design is created having in mind very busy parents. Also, the chair has a comfortable leg rest system for kids, whose feet are very tiny. The product can be adjusted to 3 different positions depending on how you want to use the tray, and it is equipped with a cup holder and an insert for removable trays to make feeding easier and carefree. Because of its design, this product is one of the multipurpose consumer favorites, mainly because of the design that is created to save space and a visually attractive form that will not be disruptive to your kitchen or livingroom furniture. The Skip Hop Tuo Convertible High Chair comes with a detachable tray, which can be easily cleaned because it is removable, and it is dishwasher safe. What’s more, the feet are adjustable, so that you can choose the height that best suits your table. The chair is secure, and it is equipped with a 5-point harness that keeps your baby safe even if you have to turn around. Created to provide a portable solution, this highchair is designed to support a healthy lifestyle for both parents and their toddlers. The design is lightweight, and the chair can be easily folded into one piece. From your backyard to RV camping trips, the product can be transported anywhere without taking up too much space. The chair is equipped with a BPA-free plastic tray. This way, your kid can play with the food without spreading it on the clothes, and the material is free of any toxic substances. The tray can be easily cleaned in the dishwasher. When your baby is starting on solid food, and they can sit up by himself, it’s the right time to get a high chair. It will give you the opportunity to supervise your kid’s meals and make him comfortable as he plays with new tastes, colors, and textures while he gulps up various foods. It’s perfect because they can join the people at the table and feel get to experience it as a joyous moment in the day and you can sit with the rest of the family. It’s also easier to clean after the meal is over. You’re going to need a bit of patience to discover the abundance of brands that produce high chairs and examine their types and styles. Then you have to examine a multitude of features if you want to pick one out. Weighing in on the exact characteristics the high chair should have is pretty hard, and you might never be sure you struck the right balance. Your choice will depend on of budget and lifestyle, too as well as the amount of space or the way it integrates with your furniture and house design. You could probably do something better with the time invested in the detailed search for a high chair, that’s why we wrote the following guide. Use it wisely to find the best high chairs for babies. We’ve managed to simplify the selection process by using our analytics and the amazing capacity to synthesize everything. The criteria below should be enough to make your choice easier. There are standard high chairs, for everyday use, with just a tray attached to them. The European high chair doesn’t have a tray because it can be pulled up to the table. It can stay in use for two years or more if the weight limit is higher. The modern high chair has the basic style of traditional ones but includes the advantages that come with modern technology, meaning you can adjust it for comfort and better use. 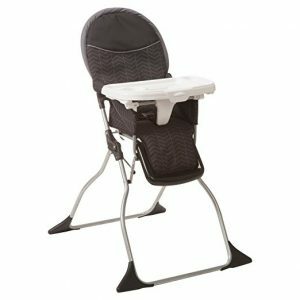 Its height, the footrest, and the tray’s height can be modified and reclining the seat allows you to feed the baby anywhere in the house, not just at the dinner table. Convertible high chairs are some of the best high chairs for babies, designed to be kept in use even when the baby has grown. You can transform them into booster seats, simple chairs with activity tray for toddlers or even a child-sized chair with a table. A space saver or booster seat gives you the possibility to transform a regular chair into a high chair, just by placing the booster on top. The hook-on is another option for those who need to save some space. You need to pay special attention to the weight specifications since you have to mount the chair up to the table by clamping them. In the series of cool baby high chairs that are portable and very portable, the fabric ones are some of the most convenient, while travel chairs are the ideal choice when you need to go places. Besides the type, there are important features to give some thought to. They pertain to the practicality of the product, but some of them have an influence on the way your house would look like and how you would arrange it. A dishwasher-safe tray would be a nice feature since feeding the baby can get really messy. There are also removable feeding trays that can replace plates. A footrest to help the baby while they’re still developing motor skills and the possibility to adjust it when the time is right is also a big deal. Wheels are welcome because you want to have the chair in and out of the kitchen or have lunch in other rooms. It’s easier to slide from one place to another instead of lifting the item or reassembling it. A reclining feature is very useful for the early stages when the baby still hangs on to their milk bottle or is less capable of sitting up. 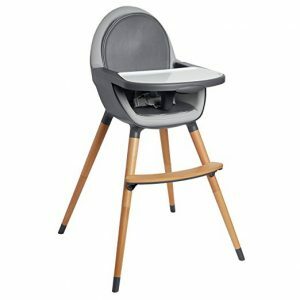 High chairs can have metal or plastic frames or can be made out of wood. These materials have an impact on their weight and durability, but they also give the room a new look. Wood frames are bulkier and a bit heavier. On the other hand, there is added stability with a narrower base. Lighter frames are metal or plastic, but not all of them will last as much. If you have wooden furniture, it’s better to buy a wooden high chair then a plastic one. It will look like it is part of the environment instead of an unwelcome addition in the wrong spot. Wood is also very sturdy and with the right products, you can keep it clean and shiny for longer. 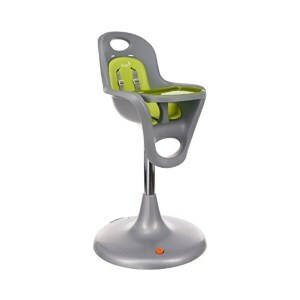 A metal-frame high chair is more suitable for a modern design with stainless steel, hard glass, and floor tiles. There will usually still be a great number of products that fit the profile, so you need additional criteria. 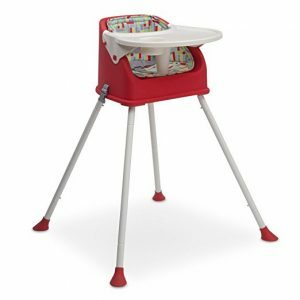 The best baby high chairs reviews point towards ease of cleaning, stability, and adjustability. You’re about to use the high chair on a daily basis, so you should spend less time cleaning it. And you need to make sure it’s a stable piece of furniture so that the baby won’t fall and suffer any injuries. The more adjustable it is, the more you can use it in various places and at different stages. 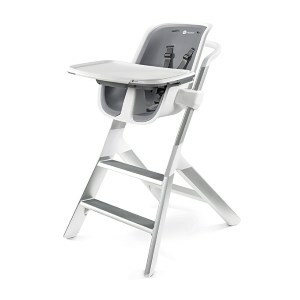 A versatile, converting high chair means a lot when you need to get rid of the tray and use a booster seat. As the toddler grows, you’re going to need that adjustment. Storage and portability are important criteria. 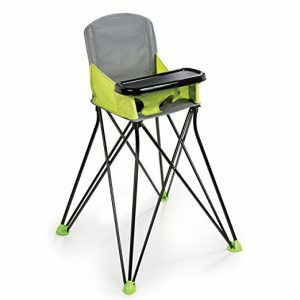 High chairs that can fold down and fit in small spaces will always be the favorites of parents. A well designed high chair will not fold when the baby is still in the seat. Adjustability is common in many furniture products designed for toddlers, and unless it’s hard to lock the components or adjusting the parts becomes an overly complicated operation, you should make good use of it. Adjustable gear is great for a growing child. Don’t forget to check for a certification seal on the products. There are manufacturers’ association’s standards as well as federal regulations that the products have to comply with. See if the harness is safe, supervise your child and don’t overstep the weight limit.